Many organisations today banter the word “Innovation” around somewhere in their vision or mission statements or in their marketing jargon, but rarely is Innovation given any justice in the corporate world. In reality and in practice Innovation is a throw away word that’s used frequently in corporate speak to sound cool, but not taken seriously. Other similar lip-service wasted words which should be taken seriously is "Strategy", "Empowerment", "Agility", and phrases like “Customer Focus” and “Our People are our Most Valuable Asset”. This stems from executive teams that manage as a closed shop with a siege mentality. But Innovation MUST be taken seriously, and people are our most valuable asset, and we must focus on our customers because together they are our primary sources of Innovation. We have examples of highly Innovative companies such as Apple, Ideo and Samsung that take Innovation seriously. How do they do it? What do we Innovate with? How do we make Innovation happen? Why not do an innovation perception check and ask 5 managers in your company to talk about Innovation in their workplaces... I have done that and most often than not had 5 different and fairly confused stories. However, as always Wikipedia provides us with a good plausible starting point towards understanding what Innovation can be from a rational, theoretical and practical point of view. Its a good base top start really getting to grips with Innovation, but that in itself is the fun part of the journey. Yes we have alluded to it – we believe Innovation is not a thing but a journey. We have based our Innovation transformation model on Complexity Science because we believe that Innovation is an emergent phenomena of a Complex Adaptive System, and should be approached as such using techniques that are aligned to complexity theory. We bundled a group of aligned complexity aligned and derived concepts together that explains to innovation as a Constellation of Creativity. The concepts bundled into the model are Infusion, Messyness, Ecosystems, Networks, Evolution and Exaptation, Creation, Discovery, Technology, Processes, People, Communication and Stories, Deductive and Abductive Reasoning, Design Thinking, and Cognitive Psychology. Another core concept in our model is that Innovation should have a leader. After all Apple had Steve Jobs who opened them up to be known as one of the worlds leading Innovators. But was Steve Jobs the only or the sole Innovator, or was he only part of an Innovation network? I suspect the real Innovators were the people in the organisation that could bring Innovation to bear. So in answer to the question who the Innovators are, we believe it it is all of us. Every one of us has the capability to Innovate. Its in our DNA as creative inventive survival driven organisms. But an innovation leader is still required to help unlock the potential in each of us. The task of this leader is to infuse Innovation into the fabrik of the organisation, and to be Innovative in itself towards creating the conditions for Innovation to emerge from the organisation. We must not allow one small Innovation to be missed because it could have been the "one" to change it all for the better. If this person was to be given a standard organisation title, they would be called the CIO - Chief Innovation Officer. 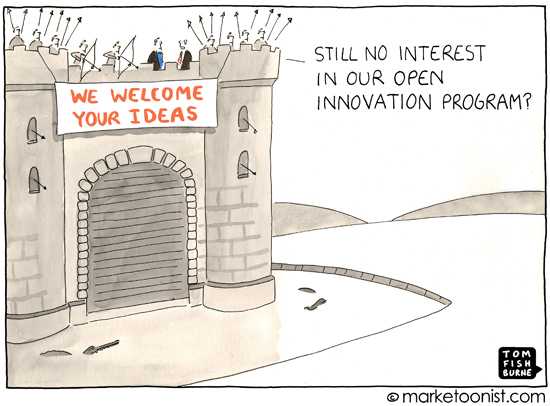 The job of the CIO is to declare the company as "Open for Innovation". Older PostLets make Melly Shum Happy!